December is here, which means you may be shopping for gifts for the Disney-phile in your life. Sure you have the limited release MagicBand for their stocking, or maybe even a phone call scheduled from Mickey Mouse if they’ve been very good this year and you’re surprising them with a trip. What about for that individual who just can’t get enough history of all things Disney? Lucky for you, there are a couple of volumes that are sure to be a hit this year! Jeff Kurtti is arguably the name when it comes to Disney history, and he has proven it again and again with each book he publishes. This year he had three volumes that were released: Travels With Walt Disney, From All of Us to All of You: The Disney Christmas Card, and Practically Poppins in Every Way. While I haven’t had the chance to pick up Practically Poppins yet, though it is on my list to read immediately after I catch a screening of Mary Poppins Returns, the other two have already become new classics on my bookshelf. Travels With Walt Disney was released this spring and chronicles more than just Walt’s vacations. Each section tackles a different period of Walt Disney’s life, a different style of transportation, or a different focus in his life. The book is almost a scrapbook of Disney’s life, filled to the brim with photographs of places and people. Starting with his early life, to his time aboard a train, cruises, and even when he brought the world in his dream, Disneyland, each section includes an itinerary and is expertly navigated by Kurtti’s narrative and vignettes. From Disney’s time in Europe with the Red Cross Ambulance Corp during World War I to the saving grace of recreation with Lily, the impact of travel is not lost on a single page in the entire volume. It is worth noting that Travels With Walt Disney, while mostly moving through Walt’s life in a linear fashion, does not run precisely in chronological order. For instance, the segment on railroads include comes in just after his formative years before jumping ahead to the 1956 feature film, The Great Locomotive Chase, and then transitioning back to his life in California in the 1930s. The jumps through Walt’s lifespan never seem out of place due to the sections having been deftly tied together. Honestly, it would be more jarring to constantly transition from a train trip, to a cruise, then to an airplane voyage, before back to another boat outing. From All of Us to All of You: The Disney Christmas Card is the more timely volume and, like many holiday spectacles, it opens with the curtains being pulled back from the middle. In this case, the centerline of the front cover. While an intriguing way to start a book, it sets the stage that this is no ordinary history text. For those who like their Christmas cards more tangible and less printed on the page, you are covered. Scattered throughout the book are 12 envelopes affixed to the pages, each holding a reproduction of a memorable greeting card. Moving ahead to the text itself, the forward addresses the origins of Christmas Cards before plunging the reader headlong into the history of Disney’s versions of the holiday greeting. Starting with the 1930s and moving to the present day, Kurtti spin through the history of the Disney animation and storytelling come to life in annual cards like a hand-turned zoetrope. If you’re looking for a glimpse of artwork from a specific Disney legend, chances are you can find it in here as everyone from Mary Blair and John Hench to Kevin Kidney can be found in this massive archive of Christmases past. I have been a fan of Jeff Kurtti’s work from the moments I flipped through the pages of Since the World Began many moons ago, and he continues to impress with each new book he releases. There are always details I’ve never heard before and layers I’ve not considered, even in something as simple as an archival look at Christmas cards. 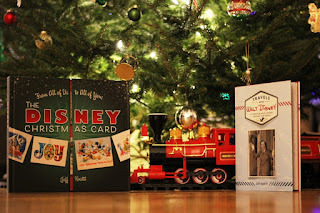 If you’re looking for a book to add to your Christmas list, or trying to find the perfect gift for the bookworm in your life, I cannot recommend Travels With Walt Disney and From All of Us to All of You: The Disney Christmas Card enough.